The economy of Indonesia has shown a significant growth over recent decades. Indonesia is one largest economy in the world with GDP more than 1 trillion dollar, and the largest economy in Southeast Asia. Indonesia economy growth after the economic crisis, moving away from lower income country to middle income countries, with average Gross Domestic Product has reached USD 3500/capita. 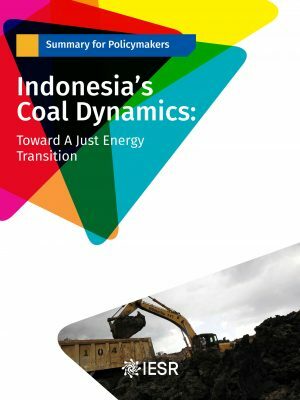 Coal is the heart of Indonesia energy policies since late 1970s. Although Indonesia coal reserve is not the largest in the world, the coal endowment in Indonesia is relatively significant compare to other fossil resources. Total coal reserve is 22.6 billion ton or 2.2% of Introduction total global reserve (BP 2018).1 Drive by the abundance of this reserve the government has set policy to increase the use of coal for generating electricity as stipulated in the various National Energy Policy (NEP) documents issued since 1980s. In NEP 2014, coal is set to contribute 30% of the total national primary energy mix by 2025 in which the total energy supply is expected to reach 400 million ton oil equivalent (TOE). Not only for the electricity, the government also plans to use coal for substituting oil and LPG to be used for transport and cooking. Full Report Available on demand, please email to iesr@iesr.or.id if you wish to have the full report digital copy.